The Orinoco crocodile (Crocodylus intermedius) is a critically endangered crocodile. Its population is very small and it can only be found in freshwater environments in Colombia and Venezuela, in particular the Orinoco river and its tributaries. Extensively hunted for their skins in the 19th and 20th centuries, this species is one of the most critically endangered species of crocodiles. It is a very large species of crocodilian and predator in the Americas. Males have been reported up to 6.8 m (22 ft 4 in) in the past, but such sizes do not exist today, 5.2 m (17 ft 1 in) being a more widely accepted maximum size. A large male today may attain 4.1 m (13 ft 5 in) in length and can weigh 380 kg (840 lb), while females are substantially smaller with the largest likely to weigh around 225 kg (496 lb). Sexual dimorphism is not as profound as in some other species. The coloration is light even in adults. The biology of the Orinoco crocodile is poorly documented in the wild, mostly due its small population. It is thought to have a more piscivorous diet with an opportunistic nature resulting in a generalist predatory behavior. The Orinoco crocodile is an apex predator and will take the opportunity to prey on a variety of reptiles, birds, and mammals, including caimans on occasion. The prey base is mostly made up of large predatory fish, challenging the general view by the locals complaining about the crocodile hunting local fish to very low numbers. Despite its large size, the Orinoco crocodile rarely poses a threat to humans, despite several reports. Reproduction takes place in the dry season when the water level is lower. Orinoco crocodiles are hole nesters, digging holes in the sand to lay their eggs. The females guard the nests and young up to several years. The Orinoco crocodile can be recognised by its relatively long snout, which is narrower than that of the somewhat similar-looking American crocodile. This species generally has a pale tan hide, though at least three coloration variations are known, with some almost completely yellowish and some a dark brownish-gray. The skin can change colour over long periods of time; this phenomenon has been recorded in other species that can gradually change the amount of melanin in their skin. 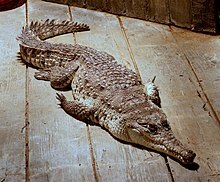 These crocodiles have dark-brown markings, which present as more pronounced bands in younger specimens and as scattered markings on mature ones. The Orinoco crocodile ranks among the largest living reptiles, as well as the largest predator in the Americas. It is arguably the largest crocodilian in the Americas, while American crocodiles and black caimans may approach similar dimensions, on average the Orinoco crocodile may be (or had been, when in healthy numbers) slightly longer. Given its possible maximum sizes, the Orinoco crocodile may rank as the third largest extant true crocodile after the saltwater crocodile and Nile crocodile (which is closely related to the Orinoco despite its substantially different range) and rank 4th amongst all extant crocodilians behind additionally the gharial, though there is little to suggest that Orinoco specimens in modern times can rival these largest species. Sexual maturity for Orinoco crocodiles is obtained for females at around 2.5 m (8 ft 2 in) while that of males seems to be obtained around 3 m (9 ft 10 in) length, with most adult crocodiles of the species exceeding 93 kg (205 lb). Average length of wild adult females from 1985 to 1992 was found to be 3.06 m (10 ft 0 in) while that of males is not known to have been surveyed at that time. If not culled by humans, mature males easily exceed 3.6 m (11 ft 10 in) and attain a length of as much as 4.1 to 4.8 m (13 ft 5 in to 15 ft 9 in) in length as they grow throughout life, perhaps weighing up to 380 to 635 kg (838 to 1,400 lb) in big specimens, while females over the expected size of 3.25 m (10 ft 8 in) in length and may sometimes exceed 225 kg (496 lb). According to Guinness Records, the average length of adults that they were able to examine was only 3 m (9 ft 10 in) and the largest specimen found firsthand was 4.2 m (13 ft 9 in). The largest specimen historically reported was shot in 1800, and allegedly measured at 6.78 m (22 ft 3 in), although the source is considered reliable, unfortunately, no voucher specimen is known from this. Because of extensive hunting for their skins in the 20th century, such giants do not exist today, and modern Orinoco crocodiles have not been reported to exceed 5.1 m (16 ft 9 in) in length. Merchán listed the maximum total length attainable for a male as 5.2 m (17 ft 1 in) and the maximum length of a female as 3.6 m (11 ft 10 in). This species is restricted to the Orinoco river basin in Colombia and Venezuela. They have been occasionally reported on the island of Trinidad, but this has not been confirmed and witnesses may have mistaken an American crocodile for the rarer species. This crocodile was once thought to have inhabited a wide range of riparian habitats, from tropical forests to the streams of the Andes foothills. Today, this species is restricted to the Llanos savannah and associated seasonal freshwater rivers. Little study has gone into the dietary biology of Orinoco crocodiles but from eye-witness accounts and partial studies from captivity and crocodile farms, the majority of the Orinoco crocodile's diet appears to consists of large fish. The species' relatively narrow snout is ideally suited to minimize water resistance in capturing such aquatic prey. However, as an opportunistic apex predator, virtually any animal living within its range could be considered a potential meal, such as reptiles, birds, and mammals. Despite having a rather elongated skull, its base snout is wide, hinting to a generalist diet. It stalks both aquatic and terrestrial prey. As a large adult, terrestrial prey may include monkeys, deer, birds, other reptiles, domestic animals, and even occasionally other large predators if the opportunity arises. Similar to many of the larger crocodile species, the Orinoco crocodile has also been observed catching and eating smaller species of crocodilians, such as adult common caimans and sometimes cannibalizing smaller individuals of its own kind. Attacks on humans have been reported, but this is highly unlikely to be a common behavior today, given the very small population of the species and its relative isolation from large human settlements. Historically attacks were not unusual and on his trip to the region in 1800, natives told Alexander von Humboldt that two or three adults were killed per year by Orinoco crocodiles. A small number of better documented fatal attacks were reported in the 1900s–1930s when the species was still relatively common. The only well-documented recent attack, on a fisherman in 2009, was serious but not fatal. A second survivor was reported in 2011 to live in La Palmita at the Cojedes River, but any details of this attack (including when exactly it happened) are lacking. Its large size may pose a threat, but this species has a less aggressive temperament compared to other large crocodiles. When water recedes in the dry season, Orinoco crocodiles retreat to burrows they excavate into the riverbanks. The adult pair mates during the drier period of the year. Adult males attract the females by roaring, the females often outnumbered the males two to one and so appear to select the males with the deepest roars. In a reintroduced population, it was found that only 6 of 14 potential adult males parented over 90% of eggs laid. Usually 14 weeks after mating, the female crocodile will dig a nest and lay about 40 eggs. It is a hole-nester as are all crocodilians and usually makes the nest on a sand bank. The eggs incubate under a mixture of soil and rotting vegetation for around three months. The most common predator of buried eggs are tegu lizards although the tegus are sometimes caught and killed by the mother crocodile. During the night, they hatch and call to their mother which digs them out of the nest and carries them to the water, which is considerably higher at this point. Young Orinoco crocodiles are often at risk from predation by American black vultures, tegu lizards, anacondas, caimans, coatis, jaguars, and other carnivores, though these species (excepting perhaps the jaguar) are sometimes too caught and killed by the defending mother crocodile. Adults have no predators except for humans and occasionally jaguars. Females have defended pods of juveniles for over three years, though closer to one year to independence is generally most common. A study of captive Orinoco crocodiles noted the aggressive behavior of adults while nesting and noted that the normally relatively docile crocodilians could not be approached while they were actively brooding. Without persecution, it is possible that Orinoco crocodiles may reach a lifespan of 70–80 years. The Orinoco crocodile is highly endangered due to excessive hunting for its hide. During the 1940s to the 1960s, thousands of these animals were slaughtered in the Orinoco River and the Llanos wetlands, and the species came very close to extinction. The Orinoco crocodile was given protected status in the 1970s, but has yet to recover. Today, it is protected both in Colombia and Venezuela, and also included on Appendix I by CITES. In addition to hunting for its hide, more recent threats include the collection of juveniles for sale in the live animal trade, pollution, and the proposal of a dam in the upper Orinoco River region. Another problem is the increased population of spectacled caimans, a smaller crocodilian that can outcompete the Orinoco crocodile for fish due to its much larger population and much more accelerated breeding rates. It's unclear how many individuals remain in the wild, but estimates range between 250 and 1500. 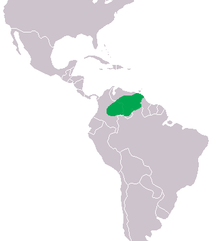 The largest subpopulation in Venezuela is in Cojedes and Sarare, with less than 500 adults remaining. A number of other smaller subpopulations exist. In November 2007, 50 individuals were held in zoos registered by Species360, of which the largest population, 35 individuals, were kept in the Dallas World Aquarium. Additionally, a large number of individuals are held at captive-breeding facilities in Venezuela. Since the early 1990s, a large number of hatchlings have been released both into private ranchlands (especially in the Llanos where nature-oriented tourism is important for the local economy) and in national parks in Venezuela. While six Venezuelan captive-breeding programs continue today, many are plagued by lack of funds or staff, as well as conflicts between private and state-owned facilities. The Orinoco crocodile became part of Proyecto Vida Silvestre, a program launched in 2014 to protect 10 wildlife species of Colombia's Llanos. Thanks to that program, between May 2015 and February 2016, 41 orinoco crocodiles were reintroduced at El Tuparro National Natural Park in eastern Colombia. ^ Balaguera-Reina, S.A., Espinosa-Blanco, A., Antelo, R., Morales-Betancourt, M. & Seijas, A. (2018). Crocodylus intermedius. The IUCN Red List of Threatened Species. ^ a b c d e f g Ross, R.P. (1998) Crocodiles: Status Survey and Conservation Action Plan. Second Edition. IUCN/SSC Crocodile Specialist Group, IUCN, Gland, Switzerland and Cambridge, UK. ^ Gladys Porter Zoo (14 October 2011). "Critically Endangered Orinoco Crocodiles Coming to Gladys Porter Zoo". prnewswire.com. ^ Greer, Allen E. (1974). "On the Maximum Total Length of the Salt-Water Crocodile (Crocodylus porosus)". Journal of Herpetology. 8 (4): 381–384. doi:10.2307/1562913. JSTOR 1562913. ^ Gorzula, S., & Seijas, A. E. (1986). "The Common Caiman", p. 44 in Crocodiles: Proceedings of the 7th Working Meeting of the Crocodile Specialist Group of the Species Survival Commission of the International Union for Conservation of Nature and Natural Resources, Caracas, Venezuela, 21 to 28 October 1984. IUCN. ^ a b c Barrio-Amoros, C.L. (February 2011). "Orinoco Croc Encounters". Reptiles Magazine: 48–53. ^ CrocBITE, Worldwide Crocodilian Attack Database: Orinoco crocodile. Charles Darwin University, Northern Territory, Australia. ^ CrocBITE, Worldwide Crocodilian Attack Database: Orinoco crocodile, 15 June 2009. Charles Darwin University, Northern Territory, Australia. ^ Blohm, T. (1982). "Husbandry of Orinoco crocodiles (Crocodylus intermedius) in Venezuela", pp. 267–285 in Crocodiles: Proceedings of the 5th Working Meeting of the Crocodile Specialist Group, IUCN–The World Conservation Union, Gland, Switzerland. ^ Information on Crocodylus intermedius. Archived 1 May 2006 at the Wayback Machine ARKIVE. ^ IUCN/SSC Crocodylus intermedius. Crocodile Specialist Group – Status Survey and Conservation Action Plan, 2nd edition. ^ "Captives held in zoos registered by ISIS". Archived from the original on 9 February 2008. Retrieved 9 November 2007. ^ Endangered Colombian crocodiles get a helping hand. Fox News (2016-02-15). Retrieved on 2019-01-25. Wikimedia Commons has media related to Crocodylus intermedius.